There are a lot of classic and restored bikes going under the hammer at the Devitt MCN Ally Pally Bonhams auction, but this certainly isn’t one of them. This unused Kawasaki Ninja H2R is one of just 27 examples built by the Japanese brand in 2015. 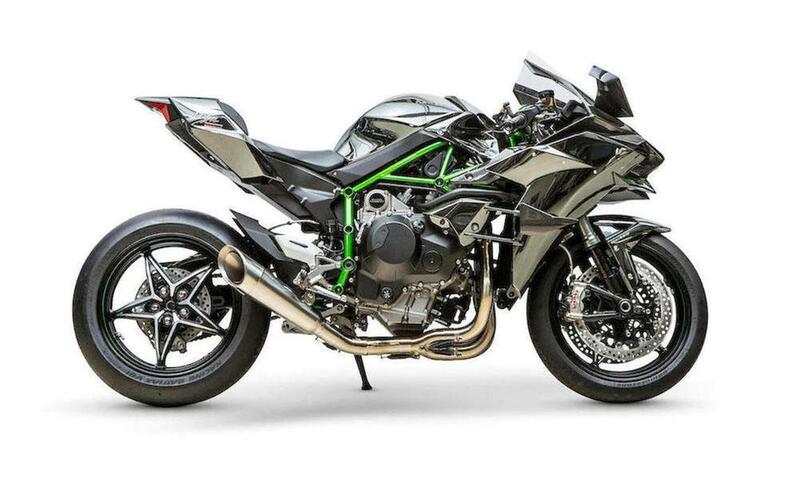 With a claimed 310bhp on tap (110bhp more than a Kawasaki Ninja H2) it’s no surprise that the H2R is not road legal. It’s also 22kg lighter than its road-going equivalent, meaning a 0-200mph time of just 16.56 seconds. The expected selling price of £16k-£20k is less than half the original asking price of £41k, but the new owner may struggle to actually use the bike. Unfortunately, it comes with slick tyres, no warranty, is too loud for almost any trackday and needs a service every 15 hours. "The UK allocation of H2Rs sold our pretty quickly, one of them going to the owner of the example offered here, which was purchased from Seastar Superbikes in August 2015. "Presented in unused, effectively brand new condition, this awesome machine comes with supplying-dealer's and manufacturer's correspondence relating to its purchase." "A brave move by Kawasaki because the Ninja is virtually in a class of its own"
"A very good, value-for-money, 250 commuter"
"Friendly, practical and swift enough to have some fun"